Join Iris in her studio in the Mission district as she guides you through each of the steps of the kiln-fired enameling process in this completely hands-on workshop to create a custom colorful pair of earrings or necklace. You select the shape, design and enamel color(s) of your jewelry and then enamel and finish your jewelry. Iris will provide several example designs to give you ideas on what you can make. You’re welcome to make one of her designs or come up with your own using the materials provided. At the end of this workshop, you'll take home an enameled pendant necklace or enameled dangle earrings handmade by you. This enameling workshop is great for anyone who loves jewelry and making art and wants to make their own piece of handmade enamel jewelry, either for themselves or as a personalized gift for a friend. It's also great for team-building and bonding experiences. - Workshop fee includes all materials. - Workshop will last 2 - 3 hours depending on the number of students in class. - There is a two person minimum in this workshop. If the minimum number of students is not met for your requested class, you will be contacted to reschedule or receive a refund. - Participants under 16 must come with their parent or guardian as you will be using a hot kiln during the class. 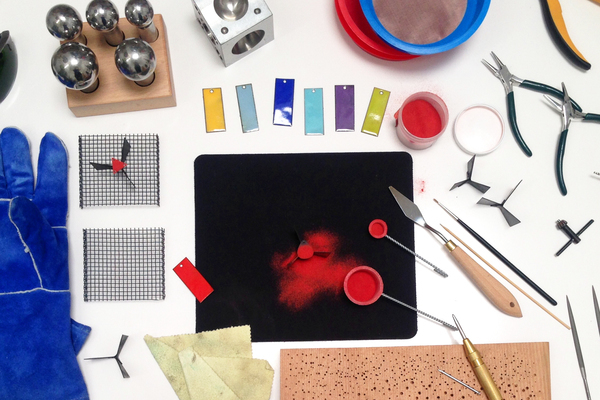 Iris Willow makes modern, colorful handmade enamel jewelry in her studio in the Mission in San Francisco. Iris has always had a creative streak and love for arts and crafts which lead her to study art in college, graduating with a BFA. Iris was first introduced to the art of enameling while living in Santiago, Chile and taking jewelry classes from a local jeweler. She fell in love with the possibility of adding color to her jewelry. It was exciting to have a rainbow of colors to choose from. She's a mostly self-taught enamelist, learning mainly through experimentation. Iris would love to share her love for the medium with you in her private enameling jewelry workshops. Iris is an experienced teacher. 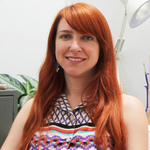 In addition to teaching jewelry classes, she has experience teaching English as a second language in Thailand, Laos and Chile. Join her for a fun, hands-on class in her studio.